On Saturday 2 June, it was announced that Manna House has been awarded the Queen’s Award for Voluntary Service. We were among 6 nominees from Cumbria (for the North West region) and 3 of those nominees were successful. 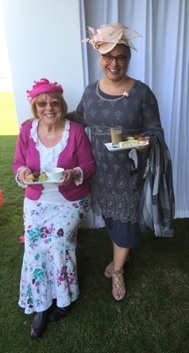 Nina Bale (left), Founder and Coordinator of the Friends of Manna House, and Andrea Aldridge (right), our Chief Officer, represented us at a special garden party at Buckingham Palace on 15 May… and didn’t they look smart?! We are so proud that our incredible team of volunteers – in the kitchen, at the drop-ins and at the Winter Shelter to name just a few – have been recognisd and this award will help us stand out from the crowd a little more when applying for vital funding. You can read all about the award, and check out the other Cumbrian winners, on the official website here.